B&W P7 review | What Hi-Fi? The B&W P7 headphones are B&W's biggest and most expensive pair of headphones to date, sitting above the company’s smaller P3 and P5 cans. But where both of these models rest on your ears, the P7s have been designed to completely envelop them. If you’re after superb sounding on-ears and portability is a priority, then these P7s could be your best buy of the year. 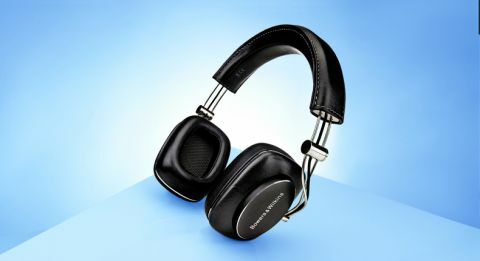 That’s right: after scooping the 2013 Award for Best Headphones in their price category, the Bowers & Wilkins P7s remain a top performer among a host of new arrivals. We start with rapper Macklemore and Ryan Lewis’s Thrift Shop and it’s hard to ignore the P7s’ enthusiasm. Full of panache, they capture the fun of the track with impeccable timing. Playful lyrics are clear and focused, and the sporadic instrumental quirks in the song pass in and out with purpose. A bold bassline is punchy and dynamic, too – it’s full-bodied while carefully avoiding veering into boomy. When it comes to balance, the P7s are nicely judged. Skip to the track Wing$ and the P7s overflow with detail; even when the song crashes into its uplifting beat, the P7s stay level-headed. Grado’s brand-new SR325es win out on absolute clarity and detail, though. If the sound doesn’t sell these ’phones to you, then the design certainly ought to. The P7s are elegant, brandishing a simple – yet classic – black and metal partnering. They really feel the part too. The ear pads create a great seal and the level of comfort is very good with the pads putting just enough pressure on the sides of your head to keep them stable and in situ – although your ears can get a bit hot during longer listening sessions. Their large size (don’t worry, they’re not embarrassingly big) has allowed B&W to design a driver suspension more similar to that found in a conventional speaker. And, if you peel off the magnetic earpads, you can actually see the 4cm drive unit through the grilles. B&W claims this new piece in the headphone puzzle has greater precision and control, and having spent some time in the P7’s company we find it hard to disagree. The headphones come with two choices of cables, one with an in-line mic and control for Apple devices and another without. The 3.5mm end fits into your portable device, while 2.5mm jack feeds into a similarly sized socket under the left earpad. Neither cable is particularly long (1.2m) though, so you’ll need to make sure your sofa sits close enough to your source if you are using the P7s in the home. The P7s might be Bowers & Wilkins’ most expensive headphones to date, but they’re worth every penny.